I draw attention to an economic theory discovered in the 1930’s by the Canadian scholar Bernard Lonergan (1904-1984). At the time, Lonergan was unable to find an economist to read his manuscripts. Eventually, however, his results were published in For a New Political Economy (Lonergan 1998); and Macroeconomic Dynamics: An Essay in Circulation Analysis (Lonergan, 1999), volumes 21 and 15 of the Collected Works of Bernard Lonergan. Volume 21 contains almost all of Lonergan’s typewritten work on economics prior to and including the 1944 Essay in Circulation Analysis. Lonergan’s theory, however, remains largely unknown to both orthodox and heterodox economics. Within the contemporary ethos, economic models typically are remote from actual economic activities in cities, towns and people’s lives. Lonergan’s theory, by contrast, begins with economic activities. It builds on a key observation that there are not just “firms and households” but two functionally distinct types of firm. Businesses can and often do function in both ways, depending on transactions. Orthodox economics has been causing great damage to world cultures and ecosystems. Attempts to merely adjust mainstream models have proven ineffective. Within heterodox economics there has been a growing interest in finding a viable alternative. This paper gives a brief introduction to the alternative provided by Bernard Lonergan’s two-flow theory. It is a theory that will ground the possibility of effective and humane strategies for local and global economies. Elements of this paper were originally presented at the International Confederation of Associations for Pluralism in Economics (ICAPE), January 4th, 2018, Drexel University in Philadelphia. JEL: B40, B41, E19, F02. One doesn’t need to be an economist to know that there is something terribly wrong with mainstream economics. World stock markets report a hugely successful 2017. Financial experts predict another good year in 2018. Yet, to mention just a few things, major chain stores have filed for bankruptcy; nations struggle with international debt; the global arms trade is booming (F., The Economist, 2017); there are apparently interminable wars and humanitarian crises; and technologies are being implemented that are destroying the environments on which we depend for our survival. No doubt, one problem is that greed has been institutionalized. A chief executive officer is not usually asked to think of the well-being of the world’s economies nor, say, help grow jobs and wages. The aim, instead, is to increase the wealth of shareholders. Resulting inequities are well known. In the USA, for instance, on a given work day, by 10:00 a.m. top CEOs earn what customer service representatives earn annually. [i] But, greed is not unique to economics. And, there seems to be no reason to expect that a healthy economy should not have wealthy investors and entrepreneurs. The literature in heterodox economics is extensive and lines of inquiry are diverse. Questions include, for example: How should wealth be distributed? Do we need not one model, but a plurality of models? What can we do to help ensure individual and collective happiness? What is a reasonable number of work hours each week? From villages to global corporations, how do we solve the problem of gender inequity? By what kind of economics can we better care for people and ecosystems? For this article, I take a different approach. I begin by inviting attention to a feature of contemporary economics that is common to both orthodox and heterodox views. I am referring to the familiar circular-flow model, a version of which is given in Figure 1. 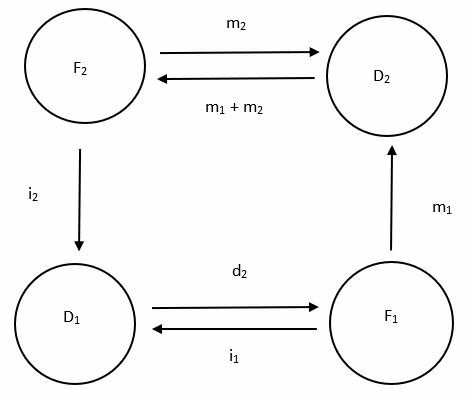 Figure 1: Model of the circular-flow of income and expenditure (Wikipedia Contributors, 2017). Adding sectors fills out the description. 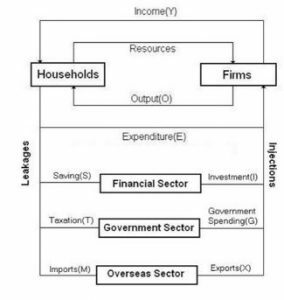 In addition to households and businesses, there is also a financial sector; government, imports-and-exports; and more can be added as needed. Figure 2: Sector circular-flow of income model (Wikipedia Contributors, 2017). The (multi-sector) circular-flow model seems reasonable and for decades it has been taught in undergraduate and graduate programs in economics. If, though, we look not to models but to actual businesses, evidence that the model is lacking can be obtained. What is needed, eventually, will be collaborative investigation into origins, significance and limitations of the model. In this section, I only draw preliminary attention to a few signs that something surely is amiss. 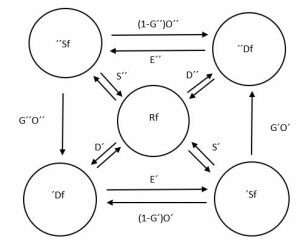 One observation is that the circular-flow model has little to say about concrete situations. In orthodox economics, the stated purpose of models is “to dispense with irrelevant details” (Mankiw, 2007, 7). But, how is one to know which details are irrelevant? In sciences like physics, chemistry and biology, notable theories have been reached quite differently, through centuries of community effort investigating data. Learning which data provisionally are relevant to explanation has only come gradually, through hard-won discovery. It is true that contemporary mainstream macroeconomics speaks of investigating “data.” (See, e.g., Mankiw, 2007, ch. 2). But, that data consists of GDPs and other similar numerical quantities pre-defined in relation to the (multi-sector) circular-flow model. A further indication that something is amiss is that, in day-to-day operations, bankers and investors rarely appeal to the circular-flow model. What are used, instead, are multi-variable Monte Carlo simulations, Black-Scholes-Merton type equations and other statistical and probabilistic forecasting methods. Note also that even though the circular-flow model has been a familiar feature of economic thought for more than 300 years, it has not proven helpful in reaching consensus on critical issues such as: wages; and the nature and possible control of booms and slumps. We get somewhat closer to the source of the problem if we look to actual businesses. Imagine, then, a trip to Trader Joe’s on Market Street in Philadelphia, down the road from Drexel University[ii]. Suppose one buys a half-gallon milk. Trader Joe’s receives about $3.00 US, depending on the brand and source of milk. 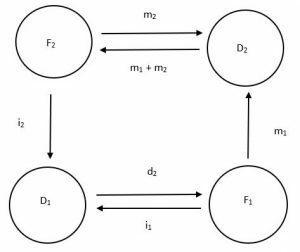 What does the circular-flow model tell us? A transaction has occurred. Appealing to the model, we might well describe it as a payment from households to businesses, money given in exchange for milk received. This names what has happened and distinguishes it from, say, a purchase made elsewhere by someone else or activities in, say, the Bank of America at Penn Center. However, as will become evident, that naming and describing does not explain the sale and purchase of a half-gallon of milk any more than, say, observing water at a bend of the Delaware River explains that water flow. For a first glimpse into Lonergan’s theory, let’s look again to Trader Joe’s. The example discussed above was of a half-gallon of milk sold at the store on Market Street in Philadelphia. That milk began its journey on one of the more than 6000 dairy farms in Pennsylvania. There are automatic milking systems. Milk is stored and transported in temperature controlled stainless steel vats. Along the way, biochemists test samples. Milk is processed, pasteurized and packaged, usually in either paper compounds or plastic bottles. There are, of course, numerous financial transactions. Finally, milk arrives at the grocery store. When a half-gallon of milk is purchased it leaves that (productive) process and enters into the standard of living. Of course, in addition to milk, there are many other goods and services that contribute to the standard of living, in Philadelphia and elsewhere. In other words, there is a flow that begins with natural resources and ends when, through purchase, consumer goods and services enter into the standard of living. Lonergan named that entire flow the basic flow. In addition to selling milk, Trader Joe’s periodically buys professional-grade refrigeration units. Not unlike a carton of milk, a refrigeration unit has its own complex back-story that also begins with natural resources. Normally, professional-grade refrigeration units are not consumer goods. At Trader Joe’s, for instance, it is their use, rather, that contributes to the flow of consumer goods into the standard of living. In the example given, milk is a consumer good. However, a simple but ultimately key observation is that not all milk is sold for consumption. There are also industrial applications of milk (Audica, Chaufin and Daufin, 2003). We are getting glimpses of the fact that in any economy there are two main flows. As already described, there is a basic flow that leads to consumer goods and services that enter into the standard of living. There is also what Lonergan called a surplus[v] flow. 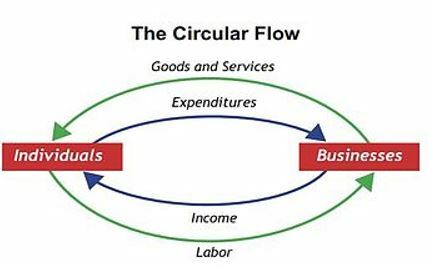 The surplus flow leads to producer goods and services, use and provision of which contribute to the basic flow. It may occur to readers that where fridges are used in the process of getting milk to homes, other goods and services are used to get fridges to grocery stores. So, are there many surplus flows, F3 for F2, F4 for F3, and so on? [vi] The problem is empirical and, as it works out (and as can be sorted out with more examples and in more advanced discussion), taking all higher “layerings” together works well for accounting. Note also that, as examples already suggest, the distinction between basic and surplus is not one of material objects or of services rendered, nor of businesses and homes, of owner and worker, of renter and rentier or any other descriptive classification. The distinction, instead, is of function within the economy. Milk and fridges can be both consumer goods and producer goods. A table might be used for a home art studio. The same kind of table produced by the same manufacturer might be used by an engineer in the office of a company that makes fridges for Trader Joe’s. 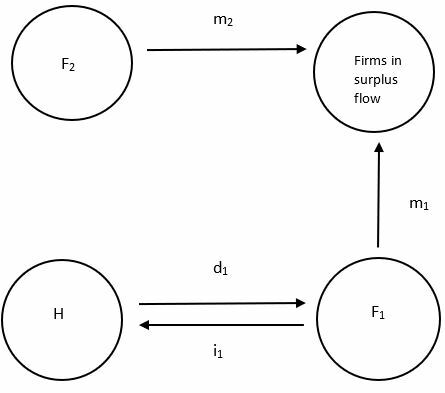 And so we also begin to see that individuals and business can and often do function in both basic and surplus flows, depending on transactions (Lonergan, 1998, 278). A compact representation of the full theory will be given below (Figure 7). Toward glimpsing something of its meaning, let’s begin again with homes and businesses (Figure 3). The description of course makes sense. But, as we will see, Lonergan’s theory goes beyond such description. In the example above, Trader Joe’s uses monies m1 for the purchase and maintenance of fridges (and more). [vii] So, to represent what actually goes on, we can add to the Homes and Firms diagram. When selling milk as a consumer good, Trader Joe’s is operating as a firm in the basic flow, a firm of type F1, say. But, a firm that sells fridges to Trader Joe’s has similar needs. For instance, it will have ways to store as yet unsold fridges (e.g., in warehouses). There are costs of purchasing, renting, maintaining and upgrading warehouses. This means, in particular, that there are payments m2 to businesses that build warehouses. 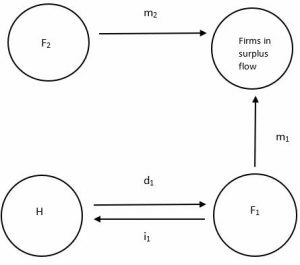 More generally, firms in the surplus flow F2 also pay monies, m2 say, to firms in the surplus flow, for maintenance and more. Figure 5: Surplus incomes m1 and m2. 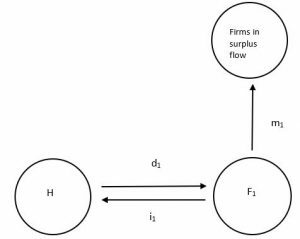 As in the basic flow, monies available to surplus firms provide the financial basis for a demand function. 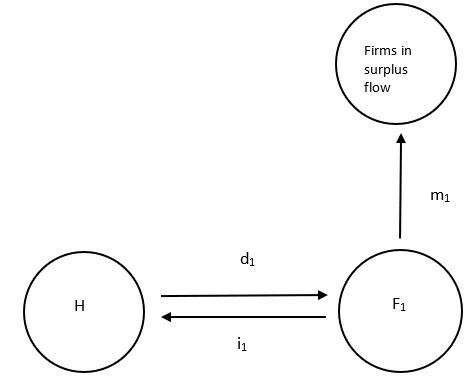 If we continue with our focus on function (rather than on individuals, buildings or businesses and other descriptives) we can now bring the diagram into better functional form by relabeling H as D1 (demand function in the basic flow) and demand of “Firms in the surplus flow” as D2 (demand function in the surplus flow). There is another component needed to complete our initial diagram. Again, it is a matter of observing what goes on. Whether one does custodial work in a warehouse or is a CEO for Industrial Tool and Die Inc., income helps pay for necessities such as food, drink and housing. More generally, the basic flow receives income, i2 say, from the surplus flow. The diagram in Figure 6 is a good beginning. Economists, financiers and accountants, however, will see that it does not yet include various familiar economic activities. Missing, for instance, are banking, stock markets and governments. Let’s explore these somewhat, beginning with ‘government.’ By this point, readers may already see that ‘government’ is not a functional distinction. A city might help fund a local playground for children. But, tenants of a city-sponsored industrial park may be involved in basic, surplus, or combinations of basic and surplus activities. And, often, cities (e.g., Philadelphia) have payroll accounts invested in stock markets. What is going on in stock markets? When stocks are bought and sold, there is a change of ownership. And, there are associated transaction costs and other expenditures. Note, however, that mere change of ownership does not produce anything new. In other words, that second-hand trade is not directly part of the productive process. For a rather different example, as announced in 2015, in industry-sponsored research with Macrete Ireland Ltd., engineers at Queen’s University in Belfast developed the world’s longest ‘flat pack’ arch bridge. What do these few examples have in common? In each case, we see evidence of a fifth function in the economy, re-distributional activities R. What is needed is “long-arch community learning” of the new theory, by studying diverse examples and investigating case-studies, small-scale and large-scale. For now, I jump to the general diagram. This is not to suggest that we can avoid the larger task. Rather, much as one finds a periodic table at the beginning of a chemistry text, or Einstein’s general field equations in the Introduction of a modern graduate physics text, Figure 7 is an invitation to growth in scientific understanding. To better link to Lonergan’s writings, instead of using ‘1’ and ‘2,’ we can use symbols ´ and ´´ for basic and surplus, respectively. From the basic flow it is some fraction G´ of outlay O´ that goes to the surplus demand function ´´Df. [viii] Other things being equal (see next section), monies that remain are then (1 – G´)O´, income for the basic flow. And, similar terms are needed for the surplus flow. Figure 7: Transfers and monetary functions. Rotate diagram in (Lonergan, 1998, 258) by 125̊ clockwise. Questioning the economic significance of GNP and GDP is not new. What is new is to see the problem functionally. The GNP, GDP, real GDP, and other similarly defined quantities represent volumes of non-differentiated economic activity. An inventory of bread lost to mold damage does not change the GDP (Mankiw, 2007, 20). Yet, such an event is significant economically. Or, again, a small economy can have a small GDP but be in a state of economic and cultural stability while a large nation may have a large GDP but be struggling under the burden of rapidly growing international debt. Note also that neither GDP nor GNP (nor other similarly defined gross quantities) reveal whether or not the basic and surplus flows are in sync, or whether or not communities are making progress or are in cultural and economic decline. Still, it is evident that some kind of aggregate quantities are relevant. Lonergan’s two-flow theory identifies two main kinds of aggregate quantity: GDP1, GDP2, (Aggregate Demand)1, (Aggregate Supply)1, (Aggregate Demand)2, (Aggregate Supply)2, and so on. On Wall Street, there are about 4 – 6 billion trades per day. About half of those are “high frequency trading,” that is, “automated quick moves in and out of securities, with the holding period sometimes less than a second” (Vlastelica, 2017). Changing ownership of goods, businesses and other assets are familiar economic activities. But, coupled with a commoditization of monies, aggregate volumes and velocities of re-distributional transactions in present-day stock markets do not remotely correlate with actual needs of the two-flow productive process. Lonergan’s theory reveals the nature of the problem and explains what many already suspect: The world’s stock markets are not part of the productive process. More precisely, they are, instead, Global Casinos parasitic to the world’s economies. The three previous observations beg the question: If neither GNP nor GDP; if not stock market indices; and if not “profit” in the sense defined by mainstream economics, what then? Among other things, Lonergan’s theory points to the need of new subdivisions in accounting. It will, however, be a “vast task” (Lonergan, 1998, 105-6). The new framework provides the basis for developing normative theories for: income, price and quantity, supply and demand, two kinds of profit, savings and investment, financing, credit, local and global accelerations and decelerations, a solution to the problem of booms, depressions and slumps[x], and new norms of international economics through “superposed circuits” (Lonergan, 1998, chapter 19). An enormous community effort will be needed to gradually unpack and expand on the new theory; and to work out in detail what the new norms will be. In the meantime, appealing to the fact that the basic and surplus flows are connected by G´O´ and G´´O´´ (Figure 7), two elementary observations are possible. If, over time, sufficient monies are not available in the surplus flow, then the surplus economy will go bankrupt. On the other hand, if sufficient revenues received in the surplus flow are not eventually returned to the basic flow then, in the long run, there will not be enough money to support production and provision of basic goods and services. The point here is not to enter into a discussion of supply and demand. It is to observe that if either the basic flow or the surplus flow is eventually drained at the expense of the other, then the economy will run into serious trouble. This also reveals that, in the long run, special equilibrium states (statistical) will factor into long-term sustainability. Allowing for lags and other variations (e.g., surges), a cross-over equilibrium state is when G´O´ = G´´O´´ or G´´/G´ = O´/O´´. Thousands of the world’s financially elite and as many global corporations hide or filter monies through tax-sheltered off-shore accounts. Under current tax treaties, one of the mechanisms used (one that will remain available until at least 2020) is called the ‘Double Irish’ or ‘Dutch Sandwich.’ Using that mechanism, in 2016 Google shielded 19.2 billion dollars (US) from taxation. With our new understanding of cross-over equilibrium states, we can begin to see why that practice is so damaging. Whatever individual or corporate motives might be, and whether or not the practice is legal, the effect is to syphon off massive volumes of financial resources from the world’s economies; and to do so without regard for effects on cross-over ratios G´´/G´ or the financial needs of world communities. “The debate over raising the federal minimum wage has been ongoing for some time now. What appears to be the main sticking point is just how will higher wages impact businesses, individuals, and the overall economy and what should the wage be raised to? The report from the CBO [CBO, 2014] suggests that raising the minimum wage will help individual low wage earners, while having somewhat of a negative impact on businesses” (Patterson, 2017). The 2014 Congressional Budget Office report is just one document in an ongoing (2018) and often heated and politicized debate. On each side of the argument, proponents appeal to collections of mutually cancelling pros and cons. (See, e.g., (Patterson, 2017).) Whatever one’s view on the issue, to try to live on present-day minimum wages means to live near or below the poverty line. For that reason, some economists and CEO’s advocate increasing the minimum wage by $2- $3 dollars per hour. There is, though, considerable resistance to the idea from banks and the very wealthy. Dire warnings are issued of economic disaster that would follow if minimum wages were to be increased in any significant way. But, precedent does not support the claim. “Seven decades of historical data find no correlation between minimum wage increases and employment levels” (Sonn and Lathrop, 2016). Note that the observation is not limited to the American economy. In Canada, for instance, “recent empirical research shows the impact of past wage hikes has been relatively neutral, retrospective proof that is surely more persuasive than speculative modelling that tries to predict the future with improbable precision” (Cohn, 2017). What does Lonergan’s theory tell us about the problem? Again, in this introductory article, very little detail is possible. But, even with a preliminary and superficial reading, clues can be had by looking to Lonergan’s discussion of cross-over ratios G´´/G´. Lonergan provides a table of ratios determined by two ranges of values for G´ and G´´(Lonergan, 1998, 55; Figure 8), respectively. Why should we look at these particular ranges and increments? The fractions G′ and G′′ are percentages. Should not both ranges, then, be 0% – 100%? Remember, however, that the problem is empirical and that Lonergan’s theory is an understanding of actual economic activities. Bamboo rakes need to be replaced frequently but are relatively inexpensive. Commercial refrigeration units in grocery stores are expensive but can remain in service for 10 years or more. In a cross-over equilibrium state, we find that payments from the basic flow to surplus demand do not generally exceed 50% of total outlay. (Otherwise, even allowing for financial support from re-distributional funding, solvency of the basic flow would eventually become a problem. See Cross-over equilibria, above.) In some businesses, the fraction G’ can be quite small. In the mid-20th century, my mother’s father was a carpenter. He worked out of a garage in the backyard of the family home in Kitchener, Ontario. Many of his tools lasted for decades. Or, think of, say, a roadside barber in Delhi, India, whose hair-cutting shears might only need to be replaced once a year or so, less frequently if a good blade sharpener is in the neighborhood. And so, for some businesses, G´ can be as low as 0.1%, or less. Similar observations apply to firms in the surplus economy. In that case, however, observe that monetary transfers to surplus demand are not cross-over. They occur within the surplus circuit. So, we get 50% as an upper bound for m2 (Figure 6) or E´´(Figure 7). In Figure 7, that transfer to surplus demand is (1 – G´´)O´´. Since a realistic range for (1 – G´´) is 0% to 50%, we therefore get a range for G´´ that runs 100% to 50%, as indicated in the left column of Figure 8. What do these observations have to do with the question of wage increases? For now, let us continue to suppose a cross-over equilibrium state (G´´/G´ = O´/O´´) and that re-distributional activities are negligible. (Although, see the final paragraph of this sub-section together with the next subsection.) In cross-over equilibrium, there are two main sources of basic income, G´´O´´ and (1 – G´)O´. Changes to either could lead to changes in wages. Partly, then, the problem of whether or not to increase the minimum wage is a problem of whether or not that can be done without overly straining the cross-over equilibrium G´´/G´ = O´/O´´. With the ranges 0% ≤ G’ ≤ 50% and 50% ≤ G” ≤ 100%, “a variation in G´ is much more significant than a variation in G´´. If G´ were 10% and G´´ were 90%, then G´ moving to 5% would advance the proportion [G´´/G´] from 9 to 18, but G´´ moving to 95% would advance the proportion from 9 to only 9.5” (Lonergan, 1998, 55). What, though, does “more significant” mean in this context? While off-set bounds for G’ and G” factor into the result, we need to also think about what the ratios G´´/G´ mean in a real economy. For instance, reduction in G´ (due, say, to increased longevity of certain producer goods), profits, savings, investments and the standard of living. Lonergan’s discussion on page 55 touches on various subtleties. See Editor’s Footnote 2, page 55, for more detail. Certainly, extensive theoretical development is called for. Think now of the vast layerings of surplus outlay O´´. A small change in G´´ would lead to enormous additional financial flow into the basic demand function ´Df. That would mean that basic wages – and, in particular, present minimum wages — could, if desired, be significantly increased. There is, then, no need for debate about a mere $2 or $3 an hour wage increase. With a change of ethos that would need to include a regard for the economy (rather than blind accumulation of wealth), and with economists, bankers and financiers making adjustments as needed, the dynamical relations plausibly allow for even doubling present-day minimum wages within a few years. I note that the conclusion reached here is under the hypothesis that the economy be in a state of cross-over equilibrium. But, the reality is that cross-over ratios tend to be in flux that is not merely random flux characteristic of a steady state. There is ongoing discovery and innovation in science and technology. There are major loans and investments for research and development. There are capital investments. There are resulting long- and short-term surges in surplus flow and basic flow; and so on. In other words, real economies are dynamic. Detailed discussion goes beyond the present context. See, however, the next subsection for a few comments. Long-term and short-term accelerations are normative. But, are the many problems associated with what are called booms and slumps also normative? Booms, slumps (and depressions) are usually described in terms of employment and unemployment, prices and profits, supply and demand, and so on. How, though, can we explain booms and slumps and that way also perhaps learn how to mitigate (or even eliminate) their damaging effects. Again, the reality is that there are two flows, which means that a more adequate understanding of booms and slumps will correlate basic and surplus activities. The new analysis will be partly in terms of long-term and short-term accelerations; redistributive activities; sale quantities and price-spreads. This topic also is too advanced for this short article. However, as some readers may already anticipate, booms, slumps and depressions are the result of a “fundamental lack of adaptation to the [two-flow] productive cycle” (Lonergan, 1998, 290). For some details, see ‘boom,’ ‘slump’ and ‘depression’ in (Lonergan, 1998; Index). There are various linked problems in mainstream economics. Descriptively, there is no problem with the circular-flow model in the sense that, yes, there are homes; business; governments; other nations; and so on. But, the circular-flow model is no more explanatory of economic flows than, say, observing that there are ponds, lakes, streams and oceans is explanatory of water flow and global hydrological cycles. Mainstream economics appeals to GDP, GNP, systems of partial differential equations for price variations, and many other mathematical structures. This is not to suggest that mathematics does not need to be part of modern economics[xiii]. But, for the most part, mathematical structures in today’s models neither regard concrete situations nor measure the two-flow workings of the economy. In contemporary macro-economics, for instance, when data is used it is obtained from and in terms of orthodox models. The problem, then, is partly structural but also partly method[xiv]. The contemporary emphasis on models is to (future) explanatory economics (now possible thanks to Lonergan’s discovery) what alchemy was to explanatory chemistry (that emerged from Mendeleev’s discovery of the periodic table). In precise terms, present-day mainstream macro-economics is economic-alchemy. The problem, however, is deeper still, more than structural and more than method. There is: institutionalized pathological greed; a notion of profit that is ignorant of the two-flow structure; a mistaken identification of savings and investment that covers over the fundamental meaning of investment, namely, investment in a potentially good idea; and so only apparently justifiable hoarding of the world’s financial resources without regard for the welfare of people and economies[xv]; a commoditization of monies that strains, stresses and distresses economies, lives, homes and businesses; the deployment of global advertising campaigns that shape desires and cultures to fit shockingly destructive ambitions; counsel for governments with remedies that at most are temporary; and an insane lack of concern for basic necessities such as clean air, food, water and human leisure. In this paper, I have provided glimpses and points of entry into a new economic theory discovered by Bernard Lonergan. The new theory is verifiable in actual economic activities at all levels, from road-side barber to chain store food-mart to global corporation. It does not prescribe any model. On the contrary, the new theory reveals the need of having economists in every town and community, attentive to local, regional and global needs and rhythms of the two-flow human productive process. There is urgency. Globally, we are in what we well might call a “Dunkirk situation.” But, far more than 380,000, upwards of 7.6 billion[xvi] lives are at stake; and our descendants. It is not being dramatic to say that the survival of cultures and ecosystems will depend on making beginnings toward implementing the new theory. How, though, is the new theory to be communicated, let alone implemented? There will be resistance. Again, this is not to imply that those who advocate mainstream models are not well-intentioned. But, as mentioned above, there is at least the problem of method, and that alone will be a major obstacle. There is the need, then, to make progress in understanding and implementing the two-flow theory. And, there is also the need to gradually transform the global ethos[xvii] in which economics will be a sub-structuring. My immediate purpose is preliminary communication of the existence of the two-flow theory: to economists, financial experts, journalists and students. Audica, J-L. (2003). Non-food applications of milk components and dairy co-products: A review. Lait, 83 (6), Nov-Dec, 417-438. Retrieved from https://hal.inria.fr/file/index/docid/895512/filename/hal-00895512.pdf. Cohn, M.R. (2017, September 30). Why business and banks hate the minimum wage. The Toronto Star. Retrieved from https://www.thestar.com/news/queenspark/2017/09/30/why-business-and-banks-hate-the-minimum-wage-cohn.html. Craven, W. F. and Cate, J. L. (1983). The Army Air Forces in World War II, Part I, Plans and Early Operations, 1939-41, Vol. I. Chicago, IL: University of Chicago Press, Office of Air Force History. F. M. (2017, March 7). Why the global arms trade is booming. The Economist. Retrieved from https://www.economist.com/blogs/economist-explains/2017/03/economist-explains-4. Hardoon, D. (2017). An Economy for the 99%: It’s time to build a human economy that benefits everyone, not just the privileged few. Oxfam Publications, Jan. 16. Retrieved from https://policy-practice.oxfam.org.uk/. Hussaini, M. Y. (1997). Collected Papers of Sir James Lighthill, four volumes. Oxford: Oxford University Press. Lambert, P. and McShane, P. (2010). Bernard Lonergan, His Life and Leading Ideas. Vancouver: Axial Publishing. Lonergan, B. (1992). Insight: A Study of Human Understanding, vol. 3 of Collected Works of Bernard Lonergan. Crowe, F. E. and Doran, R. M. (Eds.). Toronto: University of Toronto Press. Lonergan, B. (1998). For a New Political Economy, vol. 21 of Collected Works of Bernard Lonergan. McShane, P. (Ed.). Toronto: University of Toronto Press. Lonergan, B. (1999). Macroeconomic Dynamics: An Essay in Circulation Analysis, vol. 15 of Collected Works of Bernard Lonergan. Byrne, P. H. and Lawrence, F. G. (Eds.). Toronto: University of Toronto Press. Mankiw, N. G. (2007). Principles of Economics (6th ed.). New York: Worth Publishers. McShane, P. (2010). Sane Economics and Fusionism. Vancouver: Axial Publishing. McShane, P. (2017). Economics for Everyone, Das Jus Kapital (3rd ed.). Vancouver: Axial Publishing. Patterson, T. (2017, Dec. 21). The Pros and Cons of Raising the Minimum Wage. Smartasset. Retrieved from https://smartasset.com/. Schumpeter, J. (2012). The Theory of Economic Development. Piscataway, NJ: Transaction Publishers (first German edition, (1911)). Sonn, P. K. and Lathrop, Y. (2016, May 5). Raise Wages, Kill Jobs? Seven Decades of Historical Data Find No Correlation Between Minimum Wage Increases and Employment Levels. National Employment Law Project. Retrieved from http://www.nelp.org/. The Effects of a Minimum-Wage Increase on Employment and Family Income. (2014). Congress of the United States Congressional Budget Office. Retrieved from http://www.cbo.gov/sites/default/files/cbofiles/attachments/44995-MinimumWage.pdf. Vlastelica, R. (2017, March 17). Wall Street in its image. MarketWatch. Retrieved from https://www.marketwatch.com/story/high-frequency-trading-has-reshaped-wall-street-in-its-image-2017-03-15. Wikipedia Contributors. (2017). Circular flow of income. In Wikipedia, The Free Encyclopedia. Retrieved from https://en.wikipedia.org/wiki/Circular_flow_of_income. [i] The world’s population in 2017 is estimated at 7.6 billion. Presently, however, most of the world’s wealth is controlled by about 1500 billionaires – not a “1 percent,” but approximately 0.0000197 percent. On a different comparison, “[t]he world’s eight richest billionaires control the same wealth between them as the poorest half of the globe’s population” (Hardoon, 2017). [ii] Drexel University was the venue for the January 2018 ICAPE conference. [iii] At the ICAPE 2018 conference in Philadelphia, two participants observed that the question is not new, in the sense that the Leontief model also includes series of transactions. The question was then raised as to how the two approaches might compare. The Leontief model and Lonergan’s theory are, in fact, fundamentally different. This will be commented on briefly in note 9 below. [iv] This paper only provides glimpses into the two-flow theory. A helpful book-length introduction to Lonergan’s economics is (McShane, 2017). [v] In Lonergan’s theory, the name “surplus” is for a functional distinction and not be confused with contemporary usage of the term. See also next paragraph. [vi] Schumpeter also observed: “It is good to classify goods in ‘orders,’ according to their distance from the final act of consumption. Consumption goods are of the first order, goods from combinations of which consumption goods originate are of the second order, and so on, in continually higher or more remote groups” (Schumpeter, 2012, 16). Schumpeter did not, however, go on to build the distinction into a dynamical economic theory. See (McShane, 2017, viii, note 22). [vii] More? There is innovation. In 2016 Trader Joe’s purchased upgraded refrigeration units. [viii] The symbol ‘f’ for function is helpful for emphasis. With Lonergan’s notation in play, it is also a convenient way to symbolically distinguish functions from payments to and from the re-distributional function Rf. See Figure 7. 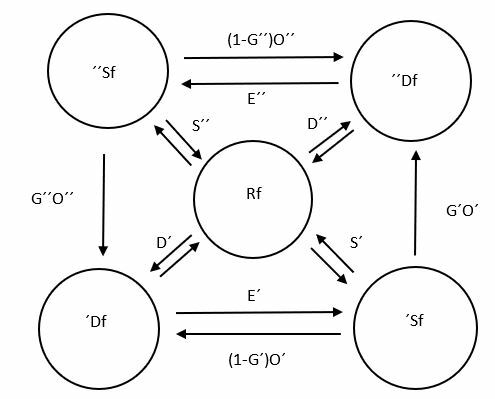 [ix] Leontief Model: An adequate comparison of Leontief’s model and Lonergan’s theory cannot be fit into a footnote. However, as mentioned in note 3 above, a few comments would not be out of place. Follow-up will need collaboration and advanced analyses. Like Lonergan’s theory, the Leontief model also builds on the fact that output from one business can be input for another. In Leontief’s approach, one works out systems of linear equations that are then the particularized Leontief model. Note, however, the following aspects of that approach: (1) The model does not distinguish functionally different economic activities. (2) The multiple sectors in the Leontief model are only descriptive, businesses x1, x2, and so on. (3) The model does not distinguish transactions between layerings from transactions within a flow from natural resources to goods or services. (4) The Leontief model does not identify re-distributional activities. (5) In applications, coefficients and variables of the Leontief model are boundary conditions – variables are fixed and coefficients are constant. As is well known, having coefficients and variables of an input-output matrix can of course be useful in computations and applications, so long as coefficients and variables remain relevant. (6) In applications, the model is static whereas in real economies and, in particular, in trade between economies, variables and coefficients can be in flux. Already, then, we see enormous differences showing between Leontief’s model and Lonergan’s theory. In applications, Leontief’s model is, by definition, a system of linear combinations with constant coefficients determined by boundary conditions. Lonergan’s theory, by contrast, provides a unifying and explanatory dynamics for functionally distinct aggregate flows of economic activity, as well as surges and other dynamics in a total productive process that begins with potentialities of nature and leads to a standard of living. Note however that, within the explanatory context provided by Lonergan’s theory, Leontief’s technique could still be useful in providing linear approximations. Adapting Leontief’s approach, linear systems would also need to distinguish basic and surplus terms, as well as which transactions were internal to a flow toward final production and which were final sales into a lower level in the productive process. [x] “Economic fluctuations present a recurring problem for economists and policy makers” (Mankiw, 2007, 252). [xi] As history shows, another long-term acceleration was not far off. The first successful jet engine flight was in August of 1939. For definitions, see note 12. [xii] The distinction between long-term acceleration and short-term acceleration is empirical. “A short-term acceleration is an increase in rates of production due to a fuller use of existing capital equipment, to a greater efficiency of labor and management, to a decrease in stocks of goods. A long-term acceleration is an increase in rates of production due to the introduction of more capital equipment and/or more efficient capital equipment. The latter is termed a long-term acceleration because it changes the basis on which the short-term acceleration works: the short-term acceleration makes the best use of existing capital equipment; the long-term improves and increases the equipment which a corresponding short-term acceleration will use in the fullest and most efficient manner” (Lonergan, 1998, 241). See also McShane (2017), Chapter 2, Flows and Surges, 21-48. Note, in particular, pedagogical discussion there on the emergence of the plough culture. [xiii] Indeed, among other things, Lonergan’s two-flow theory calls for a new flexibly structured mathematical economics that “would do for its dynamics in 2097 what Sir James Lighthill, following Lamb (I think of his classic 1897 text, Hydrodynamics) did for hydrodynamics” (McShane, 2010, 96, note 17). For Lighthill’s work, see (Hussaini, 1997). [xiv] For completeness, I need to at least mention that a needed more complete heuristics would include events and activities discussed in contemporary microeconomics and social economics. As the literature in microeconomics increasingly reveals, this will need to include up-to-date explanatory heuristics of human decision (a “layered” human event: neurological; psychological and intellectual); community and culture; and a developing front-view of history. See, e.g., (Lonergan, (1992), ‘emergent probability,’ index entries). See also note 17. [xv] There are exceptions that prove the rule. For instance, William Gates and Warren Buffet have donated billions of dollars to the Gates Foundation and other charities. While no doubt well-intentioned and helpful in many ways, the funds are modest compared to monies sequestered globally. And, the approach not only does not help us get to the root of the problem but implicitly advocates mainstream economics. [xvii] See, for instance, chapter 5 of Economics for Everyone (McShane, 2017).